Florian (inset) is charged with aggravated battery of a police officer outside the Merlo Library. 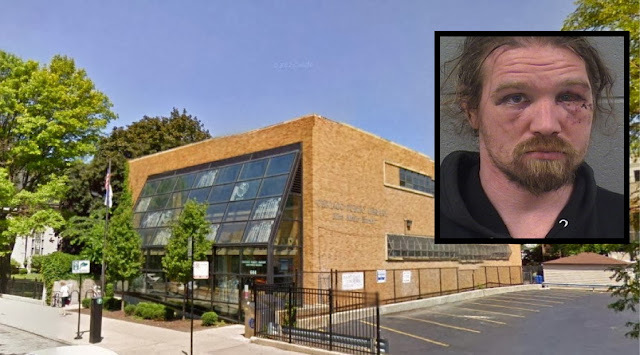 A Logan Square man bit a 19th district cop’s arm so hard, the officer suffered “deep round lacerations…bleeding and bruising” even though he was wearing a leather uniform jacket at the time, according to court records. The incident happened at 3:30 p.m. on March 2 while the officer was conducting a routine premise check at the Merlo Library, 644 West Belmont. According to police, the officer tried to detain Timothy G. Florian after seeing the 35-year-old kick the side of the cop’s squad car. Florian resisted, and the officer tried using pepper spray, but that failed when Florian blocked the spray with his hand, police said. The officer and Florian were treated at Illinois Masonic Medical Center. Florian, charged with aggravated battery of a police officer, is jailed in lieu of $50,000 bail.